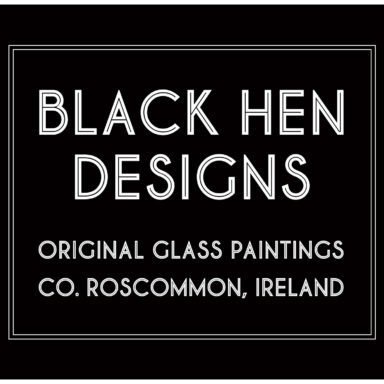 Here at black hen designs we create a beautiful range of original glass paintings and prints from our studio in Lisacul, Co. Roscommon. These designs, inspired by the Irish countryside, are brought to life through the use of vivid colours and exaggerated form and the use of handmade frames and quality materials. Black hen designs is the creation of husband and wife team Andrew and Vida Pain who over the last few years have combined their artistic talents to provide a range of art related services. Andrew is the designer of all our creations, which are then lovingly handcrafted in our studio in Co. Roscommon. With a love of nature and all things rural here in the west of Ireland, this passion is reflected in everything produced. The idea for the business came about in late 2010 and since then, we have developed a wide range of beautiful glass paintings which we sell in retail outlets throughout Ireland and on our online store. With a background in professional framing and fine art, all our glass paintings and prints are beautifully hand finished and framed by us in our studio ready to enjoy.